If you wanted proof that fads are as old as time, look no further than the Dutch “Tulip Mania” that occurred in the 1600s. We may obsess over Instagram filters and Frog memes, but at least no one’s paying over a thousand dollars for a flower. In the 1630’s tulips became the must-have item among Holland’s rich. People would pay as much as 2500 florins, or roughly $1,250, for a single tulip bulb. Those who didn’t have enough cash would swap anything they could to get their hands on them. Items apparently traded for tulips include a bed, a thousand pounds of cheese and 12 acres of land. Tulips could sell for more than houses, and canny tulip traders could make up to 60,000 florins a month. Of course, the bottom eventually fell out of the market in 1637 and speculators who’d bought outrageously priced tulips ended up being crushed by debt. The Dutch government even had to step in, and they passed a law that allowed anyone who’d ordered tulips only to pay 10% of the original price. If you’re angry that your local politician has been overspending on biscuits or building elaborate duck houses, just be glad they aren’t as bad as Mayawati. Mayawati has managed to get three neighboring 8-and-a-half thousand square foot bungalows, which she plans to connect into one giant home – all at public expense of course. The Super Bungalow has so far cost 86 crore, or $13 million. Until 2012 she was also in charge of a $1.3 billion project to build five parks across India and used public money to fill the parks with statues of herself and other Indian leaders. Each statue cost around $900,000. She even ordered one completed statue of her to be torn down and rebuilt because it wasn’t tall enough. Unsurprisingly, a lot of Indians aren’t massive fans of her, to the point that Mayawati ended up spending another $7 million training special police force to protect her statues from vandalism. Caligula was accused of being insane throughout his 4-year stint as Emperor of Rome. And if most of your people already think you’re crazy, building a pointless three-mile bridge just to say “screw you” to an astrologer is probably not going to help your case. Years earlier, an astrologer called Thrasyllus had taunted Caligula, saying that he had more chance of riding a horse across the Bay of Baia than becoming emperor. Thrasyllus was wrong, and after Caligula had risen to power, the Emperor ordered a pontoon bridge to be built across the bay. The bridge was built out of the hulls of hundreds of local grain ships, which not only cost a fortune but interrupted the area’s grain imports and led to a shortage in Rome. After it was built, Caligula donned a golden cloak and rode with 20,000 troops up and down the bridge for two days. All to insult the Ancient Roman equivalent of a horoscope writer. The bridge sank immediately after the crossing, with Caligula’s career not far behind it. In the 1950’s Ford was riding high. That was until they released the Ford Edsel in 1958. Henry Ford was so confident in the Edsel that he pumped $250 million into the car – nearly $3 billion in today’s money. There was only one problem. Ford had a vision in his head and wasn’t going to change it. He spent millions researching what Americans wanted the car to be called, even consulting Pulitzer Prize-winning poet Mariane Moore, but in the end, he threw all the testing away and decided to name it after his son. Although, considering Moore wanted to call the car either ‘The Intelligent Whale” or “The Utopian Turtletop,” maybe it was best to ignore her advice. Ford went through a similar course with the car’s design, apparently not even pretending to read the polling that his company had done. The result was an inefficient $3,500 car that Americans thought was hideously ugly. Only 117,000 were ever sold. In 1911 British delegates in India decided to host a giant parade called the “Delhi Durbar” to celebrate the coronation of King George V.
As you might imagine from a celebration featuring elephants, lavish horse-drawn carriages, and over 50,000 troops, the costs soon grew out of control. The event itself required the equivalent of $620 million. An extra $33 million had to be spent just transporting George and the troops around. Worse still, the King’s crown was not allowed to leave Britain, meaning another one had to be fashioned. The new crown had over 6000 diamonds in it and added another $70 million to the expenses. Even after all that spending, the British couldn’t guarantee that things would go to plan and, sure enough, they didn’t. While the Indian nobility was supposed to line up and kiss the king’s hand, one, the Gaekwad of Baroda, refused. He even turned his back to the King, sparking an international incident between the two nations. Tensions didn’t get any better after the British government stuck India with most of the bill. When King Philip of Spain spent 10 million ducats, or $850 million, on his armada in 1588, he probably had visions of it sailing gloriously into battle. The 130-ship Spanish Armada was intended to conquer England but only fought in one minor battle. Despite the English only destroying 5 of their ships when the sides clashed at Gravelines, the Spanish had to retreat from the whole expedition after disease became rife on board. The Spanish were in such a rush that they even threw away their anchors, something that didn’t serve them well when they sailed straight into a storm. Unable to secure themselves, the ships were swept into each other by the waves. Only 67 ships survived. The battered fleet returned home to a humiliated King. Philip was bankrupted, having blown two-thirds of his empire’s revenue on the invasion. Spain had to be bailed out by other nations, forever ending its status as a world power. Despite what you might think, the largest Catholic church in the world is not the Vatican. Nor is it in other largely Catholic nations like Italy or Brazil. Of all places, it’s in the Ivory Coast, a country with fewer Catholics than 39 other countries and where only 21% of the population believes in the religion. Built in the late 80s by the country’s first President, Felix Houphouet-Boigny, the Basilica of Our Lady of Peace is 32,000 square feet of marble-covered excess. The behemoth structure is 158 meters tall, 15 meters taller than St. Peter’s Basilica and the Dome alone weighs a staggering 310 tons. Naturally, none of that came cheap. The basilica cost $300 million to build and doubled the Ivory Coast’s national debt. As if the initial costs weren’t enough, the building costs $1.5 million a year just in upkeep. Still, all worth it to create such a popular attraction, right? Well, despite a capacity of 18,000, the church’s sermons are rarely attended by more than a few hundred people. The King of 14th century Mali, Mansa Musa, was – and remains to this day – the richest man to have ever lived. Bill Gates and Carlos Slim may be doing okay for themselves, but neither can match Musa’s $400 billion net worth. In fact, Musa was wealthier than the five current richest men in the world put together. As a Muslim, Musa was compelled to make a pilgrimage to Mecca at least once in his life. And he did in 1324, bringing 80 camels with him, each carrying 300 pounds of gold. He gave generously to the poor as he journeyed, apparently throwing so many coins on the floor when he traveled through Cairo that the streets sparkled gold. While we wouldn’t usually say charity is a waste of money, in this case, he’d have been better off keeping his money in his pockets. The sudden influx of gold rendered the substance worthless, causing a super-inflation of Egypt’s currency and nearly destroying its economy. Even 12 years later the market hadn’t fully recovered from his trip. In the end, Musa had to take some money back just to help the ailing economy. There have been plenty of headlines about Trump’s Mexican border wall, but even its most strident critics don’t think it’ll cost hundreds of billions of dollars. That’s what modern estimates place as the expense of the famed 13,000-mile Great Wall of China. 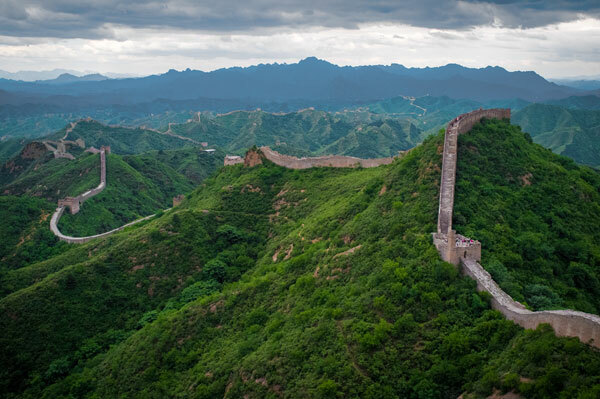 Constructed by the 14th Century Ming Dynasty to keep the Mongol hordes out, the stone wall took hundreds of years to build and cost over 400,000 lives. Slave labor cut down on some of the building expenses, but a wall that used over 110,000000 tons of stone was never going to come cheap. Although there’s no way to know the exact cost of the project, modern estimates put the bill at $350 billion. And that’s not even factoring in the soldiers needed to man the 25,000 watchtowers that ran along the wall’s perimeter. Worst of all, the wall was particularly useless at keeping out the Mongols. Even after such a massive building project, there were still gaps where the construction would have been impossible. Unsurprisingly, the Mongols only slipped through these gaps and carried on raiding. Dammit wall, you had one job. If you’re ever wondering why you’ve never heard of the mighty Scottish Empire, this is why. In 1698 King Willian II of Scotland decided to try and make Scotland a world-respected trading power by establishing the colony of “Caledonia” on the Darien Strait in Panama. In fact, he was so keen on the idea that he sank 25% of Scotland’s entire GDP into the scheme. The first fleet set sail with 1,200 eager colonists, but after three months 70 of the passengers had died of disease, and the rest were starving. The English colonies that surrounded Caledonia refused to trade with it, and the local tribes had no interest in buying the thick woolen fabrics, which the Scots had brought to this hot part of the world. To make matters worse, Spain suddenly decided that it wanted the land. By the time the Scottish sent a second fleet in 1699, the Spanish army had already slain the entire first colony and was lying in wait to kill them. Over 2,000 Scots died in Caledonia, and the project cost Scotland the equivalent of $83 million, forcing Scotland to join their old enemy England and become Great Britain.